The Global Volcanism Program has no activity reports for Kialagvik. The Global Volcanism Program has no Weekly Reports available for Kialagvik. The Global Volcanism Program has no Bulletin Reports available for Kialagvik. The Global Volcanism Program has no synonyms or subfeatures listed for Kialagvik. Kialagvik is a small, poorly known glacier-mantled stratovolcano NE of Chiginagak volcano with a Holocene central lava dome and associated pyroclastic-flow deposits (Riehle, in Wood and Kienle 1990). The volcano draws its name from the Eskimo word for Wide Bay, which lies beyond the mouth of Kialagvik Creek, NE of the volcano. The central dome rises 350 m above an ice field that mantles the upper part of the volcano. Andesitic lava flows and overlying dacitic block-and-ash-flow deposits are exposed broadly on the SW flank and in a small area on the NE flank. No historical activity is known from Kialagvik. Miller T P, 1979. (pers. comm.). Miller T P, Smith R L, 1975. Ash flows on the Alaska Peninsula: a preliminary report on their distribution, composition and age (abs). Geol Soc Amer Abs Prog, 7: 1201. The Global Volcanism Program is not aware of any Holocene eruptions from Kialagvik. If this volcano has had large eruptions (VEI >= 4) prior to 10,000 years ago, information might be found on the Kialagvik page in the LaMEVE (Large Magnitude Explosive Volcanic Eruptions) database, a part of the Volcano Global Risk Identification and Analysis Project (VOGRIPA). There is no Deformation History data available for Kialagvik. There is no Emissions History data available for Kialagvik. The SE side of a Holocene central dome at Kialagvik volcano rises 350 m above a surrounding ice field. 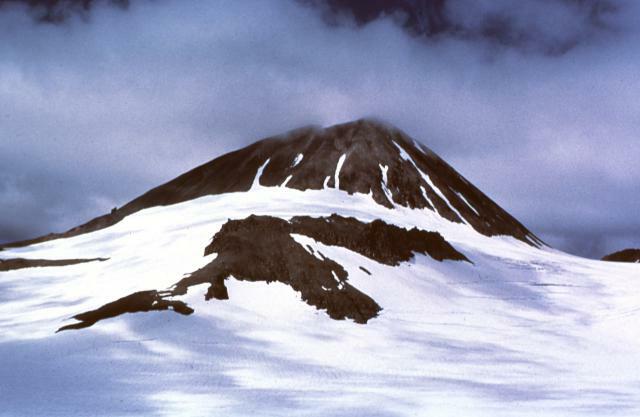 Kialagvik is a small, poorly known stratovolcano that lies at the NE end of a segment of the Alaska Peninsula that includes neighboring Chiginagak and Yantarni volcanoes. Andesitic lava flows and overlying dacitic block-and-ash-flow deposits from Kialagvik are exposed broadly on the SW flank and in a small area on the NE flank. No historical activity is known from Kialagvik. Photo courtesy U.S. Geological Survey, Alaska Volcano Observatory. There are no samples for Kialagvik in the Smithsonian's NMNH Department of Mineral Sciences Rock and Ore collection. Large Eruptions of Kialagvik Information about large Quaternary eruptions (VEI >= 4) is cataloged in the Large Magnitude Explosive Volcanic Eruptions (LaMEVE) database of the Volcano Global Risk Identification and Analysis Project (VOGRIPA).